Johann Carl Friedrich Gauss (; German: Gauß [ˈkaɐ̯l ˈfʁiːdʁɪç ˈɡaʊs] (listen); Latin: Carolus Fridericus Gauss; (30 April 1777 – 23 February 1855) was a German mathematician and physicist who made significant contributions to many fields in mathematics and sciences. 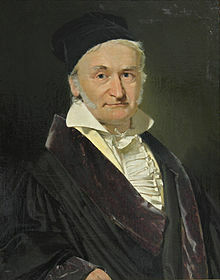 Sometimes referred to as the Princeps mathematicorum (Latin for "the foremost of mathematicians") and "the greatest mathematician since antiquity", Gauss had an exceptional influence in many fields of mathematics and science, and is ranked among history's most influential mathematicians. It may be true, that men, who are mere mathematicians, have certain specific shortcomings, but that is not the fault of mathematics, for it is equally true of every other exclusive occupation. I am coming more and more to the conviction that the necessity of our geometry cannot be demonstrated, at least neither by, nor for, the human intellect. To such idle talk it might further be added: that whenever a certain exclusive occupation is coupled with specific shortcomings, it is likewise almost certainly divorced from certain other shortcomings. The problem of distinguishing prime numbers from composite numbers and of resolving the latter into their prime factors is known to be one of the most important and useful in arithmetic.